I was craving stout last fall...something good and dark and roasty to help fight off the cool evenings. Not too much bitterness; something that erred on the side of smooth with a touch of sweetness. 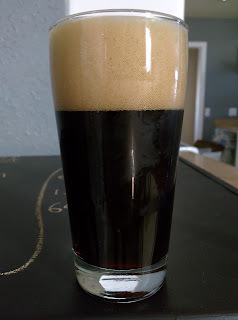 So, I started putting together a stout. Maris otter as the base malt, because it is delicious. Some dehusked carafa 3 and chocolate malt to get some rich darkness without a lot of burnt bitter flavor. To round out the malts, I through in some rye (for the hell of it honestly), and some caramel 120 for a little burnt sugar sweetness. For the hops I went with fuggles and east kent goldings. A little research showed that these hops do well in stouts. I brewed this batch back to back with the pumpkin ale, so I step mashed and ended up with piss poor efficiency. The end result was pretty good. It was a little thin; poor efficiency was the cause I guess. The longer it was in the keg, the better it got. Turned out I accidentally freeze distilled it a bit. I froze out a pint or two of water because the keezer was set to low. The keg kicked much sooner than expect because of that, but the last few pints were excellent. Much richer and fuller flavored. pictures and brew notes below. Kegging Day. There was less trub than usual. 10/4/2015: brew day. 1/4 tsp burton salt. 3.25 gallons of water for mash. 2 cups water for grain rinse. 11 brix at start of boil. 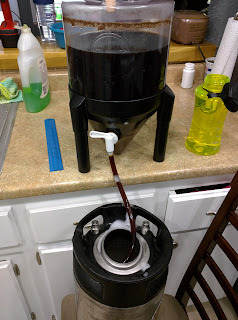 Gravity into the fermenter was 1.043/10.5 brix. 10/6/2015: little airlock activity. Gravity at about 1.016. 10/14/2015: gravity still 1.016. Samples taste thin. Guess this is terminal gravity. 10/17/2015: kegging day. Final gravity is 1.016. 10/22/2015: put in keezer. re-pressurized and shook a bit. 10/29/2015: tasting. Very smooth. Roasty chocolatey smell. Some sweetness in the smell too. Bit of maltiness on the nose too. Smooth mouthfeel, crisp finish. Very little astringency. Very tasty, with a few tweaks it could be great. 11/26/2015: keg kicked. 230oz. Some was frozen and wasted when the keg was clean. such is life.